The Purdue All-American Marching Band has raised the bar this year when it comes to moving picture shows in the B1G conference. We all know about Ohio State's amazing formations that they make each week, but Purdue set the bar earlier this season with their horse and carriage formation. This past Saturday they raised the bar again. During their show they created two dancing stick figures that ball room danced on the field. It's one of those formation that you have to see to believe. Here is a video from halftime that we sped up for you so you can see the dance sequence. The drill writer of that sequence is the real winner here. It is truly fantastic. 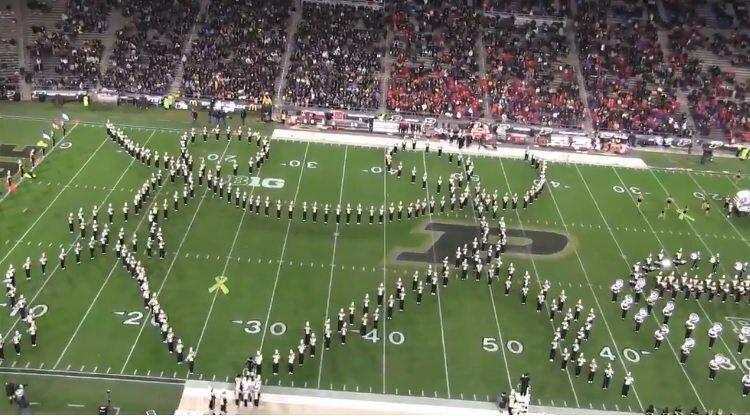 We've seen a lot of moving pictures this season in the B1G including Minnesota's row boat and Ohio State's Transformer, but there may not be anything that can top this from Purdue. Maybe only Purdue can top themselves now. We hope we get one more mind-blowing formation sequence this season from them.